Married Name 24 November 1920 As of 24 November 1920,her married name was Hartung. Theresa Mary Averkamp was born on 28 May 1896 at Grant, Wisconsin. She was the daughter of George Averkamp and Christina Manemann. Theresa Mary Averkamp married George John Hartung, son of John Hartung and Margaret Wiederhold, on 24 November 1920. Theresa Mary Averkamp died on 10 December 1988 at Grant, Wisconsin, at age 92 Theresa M. Hartung, age 92, Platteville, died Saturday, Dec. 10, 1988, at Southwest Health Center following a brief illness. The daughter of George and Christina Manemann Averkamp was born May 28, 1896, in Dickeyville. She attended the Dickeyville Public Schools. On Nov. 24, 1920, she was married to George Hartung. They farmed all of their married life in Grant County. She was a member of St. Mary's Catholic Church and the Altar Society. She was also a member of the Catholic Knights. She was preceded in death by her husband on Sept. 8, 1948; one son, Cletus, on Jan. 26, 1948; as well as two children in infancy. Survivors included four sons, Linus, Mineral Point, Wilfred and Robert, both of Platteville, and Eugene, Georgetown, Calif; three daughters, Mrs. Mark (Florence) Meyer, Platteville, Mrs. Rosemary Reisen, Nicholosville, Ky., and Mrs. Richard (Lorraine) Van Sant, Nekoosa; 17 grandchildren; and 19 great-grandchildren. Funeral services will be held Wednesday, Dec. 14 at 10:30 a.m. at St. Mary's Catholic church of Platteville with Fr. Steve Zwettler officiating. Burial will be held in Calvary Cemetery. Friends may call at the Mergen Funeral home of Platteville from 3 until 9 p.m. today, Dec. 13. George Averkamp was born on 2 January 1860 at Wisconsin also reported as 2 Jan 1861. He was the son of Anton Vicentius Averkamp and Anna Mary Wilmes. George Averkamp married Christina Manemann, daughter of John Clemens Manemann and Anna Christina Uhlen, circa 1889. 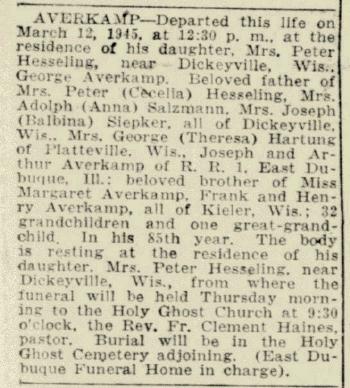 George Averkamp died on 12 March 1945 at Dickeyville, Grant, Wisconsin, at age 85 George Averkamp obituary. Married Name circa 1889 As of circa 1889,her married name was Averkamp. Christina Manemann was born on 15 September 1862 at Grant, Wisconsin. She was the daughter of John Clemens Manemann and Anna Christina Uhlen. Christina Manemann married George Averkamp, son of Anton Vicentius Averkamp and Anna Mary Wilmes, circa 1889. Christina Manemann died on 10 February 1935 at Grant, Wisconsin, at age 72. Christina Manemann had 4 with 4 living in 1900 children. She had 7 with 6 living in 1910 children. Married Name 8 August 1922 As of 8 August 1922,her married name was Hartung. Nellie F. Lezotte was born on 17 January 1897. She was the daughter of Anthony Lezotte. Nellie F. Lezotte married Joseph Hartung, son of John Hartung and Margaret Wiederhold, on 8 August 1922. Nellie F. Lezotte died on 7 May 1931 at age 34. Henry P. Hartung was born on 28 October 1901. He was the son of John Hartung and Margaret Wiederhold. Henry P. Hartung died on 28 January 1985 at age 83. Anthony Hartung was born on 5 December 1907. Anthony Hartung died on 21 February 1985 at age 77. Albert Hartung was born on 14 September 1900. Albert Hartung died on 4 July 1942 at age 41. Name Variation Johannes Hartung was also known as John. Johannes Hartung married Maria Anna Bischof. Johannes Hartung was born in 1827. Married Name Her married name was Hartung. Maria Anna Bischof married Johannes Hartung. Maria Anna Bischof was born in 1827. Elsie Lee Womack married Arthur Hartung, son of John Hartung and Margaret Wiederhold. Elsie Lee Womack was born on 30 August 1903. She died on 20 January 1970 at age 66. Frank Heinz married Elizabeth C. Hartung, daughter of John Hartung and Margaret Wiederhold. Frank Heinz was born on 22 May 1901. He died on 31 January 1988 at age 86. Carolina Hartung was born on 17 February 1894. She was the daughter of John Hartung and Margaret Wiederhold. Theresa Agnes Hartung was born on 25 March 1897. Clarence J. Hartung married Doris Amelia Anderson. Clarence J. Hartung was born on 4 April 1905. Clarence J. Hartung died on 4 May 1997 at age 92. Doris Amelia Anderson married Clarence J. Hartung, son of John Hartung and Margaret Wiederhold. Doris Amelia Anderson was born on 10 December 1913. She died on 16 October 1988 at age 74. Married Name 13 September 1969 As of 13 September 1969,her married name was Bichler. Rosaline Hartung was born on 27 October 1909 at Clark, Wisconsin. Rosaline Hartung married Anton H. Bichler on 13 September 1969. Rosaline Hartung died on 15 December 2004 at age 95. Anton H. Bichler was born on 11 July 1911. He married Rosaline Hartung, daughter of John Hartung and Margaret Wiederhold, on 13 September 1969. Anton H. Bichler died on 24 January 2003 at age 91. Silas Henricksen was born on 8 September 1904 at Beresford, South Dakota. He was the son of Henry Henricksen and Laura Hansen. Silas Henricksen married Elizabeth Rosabelle Buum, daughter of Lars J. Buum and Randi Stubben, on 22 June 1927 at Beresford, South Dakota. Silas Henricksen died on 2 July 1982 at Portland, Oregon, at age 77. Henry Henricksen married Laura Hansen. Married Name Her married name was Henricksen. Laura Hansen married Henry Henricksen. Bonnie Beth Henricksen was born on 8 August 1930 at Watertown, South Dakota. She was the daughter of Silas Henricksen and Elizabeth Rosabelle Buum. Bonnie Beth Henricksen died in January 1997 at Portland, Oregon, at age 66. Name Variation Andreas Kastly was also known as Andrew. Name Variation Andreas Kastly was also known as Kestle. Andreas Kastly was born on 20 October 1864. Name Variation Jacob Kastly was also known as James. Name Variation Jacob Kastly was also known as Kestle. Jacob Kastly was born on 27 August 1866 at Wisconsin. Name Variation William Kastly was also known as Willie. Name Variation William Kastly was also known as Kestle. William Kastly was born on 17 July 1868 at Wisconsin. Name Variation Joseph Kastly was also known as Kestle. Joseph Kastly was born on 19 March 1870. Name Variation Friderick Christian Kastly was also known as Freddie. Name Variation Friderick Christian Kastly was also known as Kestle. Friderick Christian Kastly was born on 26 October 1871 at Wisconsin. Married Name circa 1876 As of circa 1876,her married name was Kastly. Josephine (?) was born circa 1839 at Baden, Germany. She married Jacob Kastly circa 1876. Rudolph Kastly was born circa 1876 at Wisconsin. He was the son of Jacob Kastly and Josephine (?). Andrew Kastly was born circa 1877 at Wisconsin.